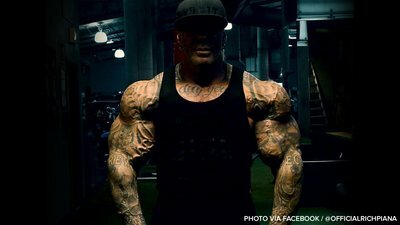 The online fitness community mourns the passing of one of its most outrageous larger-than-life characters, Rich Piana. Bodybuilder Rich Piana has died after three weeks in a medically-induced coma, according to numerous Internet reports. His girlfriend has also confirmed his passing. He was 46 years old. Piana had been a diehard lifter and bodybuilder since early adolescence, and a national-level competitor throughout his twenties, culminating in winning the title of Mr. California in 1998. He was also an actor, appearing in numerous commercials and TV series, and the owner of 5% Nutrition. In recent years, Piana earned an immense following online for his otherworldly physique, but also for his willingness to share every facet of his life in hundreds of YouTube videos and across numerous other social media platforms. He was an open book, for both better and worse, and his often brutally frank treatment of taboo topics earned him an equally loyal following of admirers and critics. "I gave everything to be the best and did #whateverittakes to win!" Piana wrote in his final Instagram post, from August 10. "Whatever it takes" was the also the slogan of Piana's supplement company, 5% Nutrition, and he lived the slogan in his eternal quest for ever-greater muscular size and definition. While this made him controversial, it also resonated with the millions who will mourn his passing.